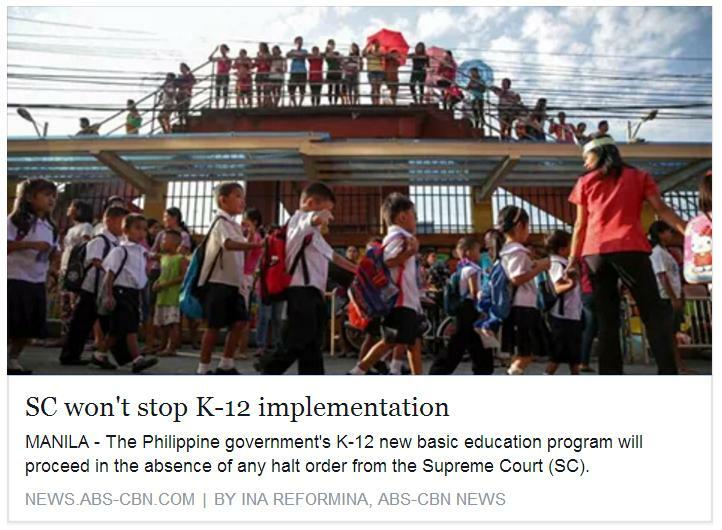 Newspapers in the Philippines have reported that its Supreme Court had ruled against petitions to suspend DepEd's K to 12. My reading of this news is that there is no super majority among the justices who are currently inclined to rule against DepEd's K to 12. And perhaps, the court simply wants to wait and see what would happen when school starts in June before making the final decision on whether DepEd's K to 12 is constitutional or not. I am posting on this blog a reaction to the recent Supreme Court ruling by one of the petitioners, Troy Colmenares (with his kind permission). INTERAKSYON: “The Court denied the prayer for the issuance of a temporary restraining order and or writ of preliminary injunction,” SC Public Information Office Chief, lawyer Theodore Te said after the en banc session. ABS_CBN: "The Supreme Court will continue to weigh in on the case and rule on its merits." Rappler: "The Court denied the prayer for issuance of a temporary restraining order and/or writ of preliminary injunction, the SC said in the press briefing Tuesday, March 15." At the outset, this is not the first time SC made a PR Disaster. How It could possibly choose to call a "press briefing" without informing the parties concerned is definitely unacceptable and beyond the bounds of common courtesy. Thus, while the articles were being written, my co-petitioners and counsels were at limbo at what had been junked - the petition itself or the TRO and the Writ of Preliminary Injunction. To set the record straight, it is only now that we found out it was the TRO that was junked - after reading the news. Since when did public concern become a PR mileage? I started making noise about the unconstitutionality of K-12 Program before the law was even passed. I got ignored by the public officials I reached out to, from the teachers, to the local Councilors, to my own Mayor, to the Office of the President not to mention DepEd, and to the Senate and Lower House. I sought for help in Bacolod City but to no avail. Who was I in the first place but an ordinary citizen? It took the caliber of a UST Professor Rene Luis Tadle to believe me and refer me to his friend, head of the National Union of Peoples' Lawyers in Baguio Cheryl L. Daytec-Yañgot. Both Prof. Rene and Ate Chyt took me seriously and joined me in filing a class suit end of May 2015, now docketed as G.R. No. 218098. There were other petitions as well now docketed as: G.R. No. 216930, G.R. No. 217752, G.R. No. 218045, G.R. No. 218123, and G.R. No. 218465. My case is being handled pro bono by several lawyers at the National Union of Peoples' Lawyers in Baguio. From the filing of the petitions up to the filing of several Urgent Motions to Issue a TRO, it is sad that it was only a year later that a resolution appears to have been issued (we have not even received it yet for heaven's sake! ), dismissing thereby, WITHOUT HEARING THE MERITS OF THE UNANIMOUS PRAYERS FOR TRO IN AN ORAL ARGUMENT. How deaf can the court be? Myself aside, I have fellow petitioners who are members of the Congress of the Philippines, representing millions of voters, millions of students who could not enter tertiary education and their respective parents, and hundreds of thousands of teachers who will be displaced. For 32 weeks, with all due respect for the Court and the subjudice rule, we remained silent as to the merits of our causes of actions - contenting ourselves with one word from the court - "NOTED". Today, we cry rivers of tears to hear the TRO had been dismissed for reasons we do not even know, but the media does, without even hearing out some if not all of the petitioners. Could you imagine for us and the rest who had high hopes and regards for the Court of Last Resort? How the *bad word* does the Court expect me to become an officer of the court with this mockery to rights affecting both the present and future generations? Courts all over the world are one in saying that "justice delayed is justice denied". Since end of May until 18 November 2015, we heard NOTHING from the respondents, except several motions for extension of time from the various parties - ENOUGH FOR THEM TO CREATE WIGGLE ROOMS BY ISSUING DEPARTMENTAL ORDERS THAT ARE ILL-CONCEIVED TO COVER UP AND CIRCUMVENT THEIR UNPREPAREDNESS. In my case, our 55 pager petition, a combination of several brilliant minds that the country needs to prevent injustice, got a meagre 2-pager response in November from the OSG, merely reiterating what the Senate Journal contained. I am not, neither are my pro bono counsels and co-petitioners, stupid, to overlook that caveat. Is that all the added value that the OSG has? To state the obvious? With me are co-petitioners-taxpayers, and we deserve more than just a 2-pager response. If that is the case, why don't we hire copy-paste writers instead of lawyers in the government! But did the OSG hear from us? No! We had, and still have faith that the High Court would uphold the 1987 Constitution, as they should, and as they reportedly claim they would. One of our causes of action is simple. DepEd Order No. 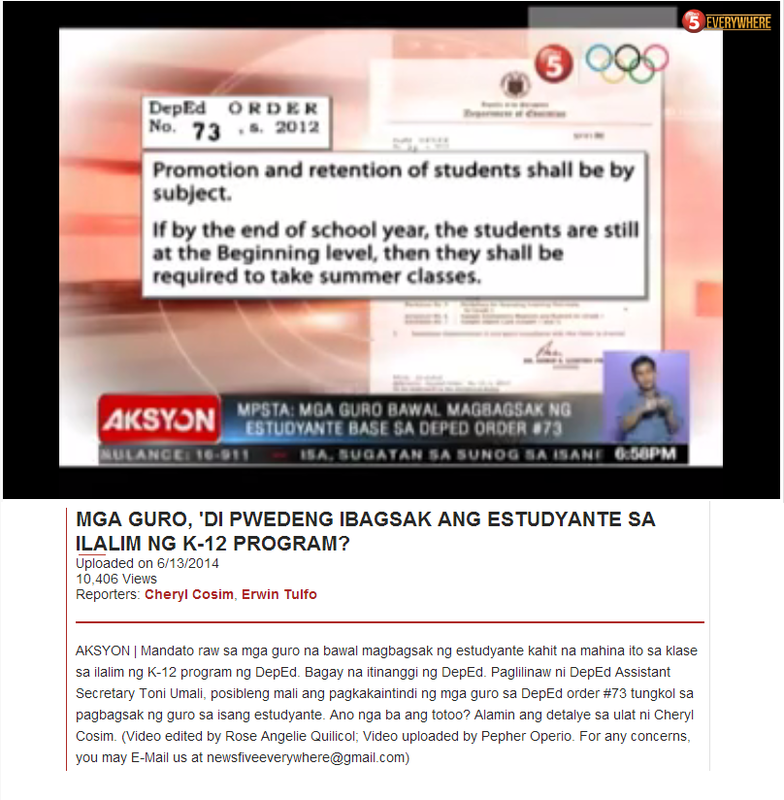 31 s. 2012 is implementing a K-12 Program that is only being conceived at the time in Congress. 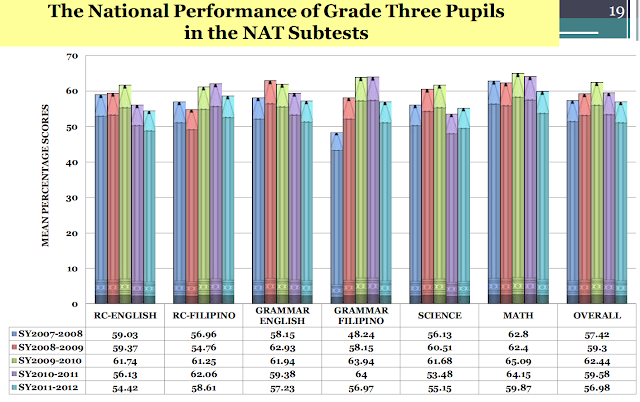 That is clearly an erosion of Congressional authority that requires a simple comparison of two dates: when the K-12 law was passed and when the DepEd Order was passed. That is a no brainer!!! It is exactly this DepEd Order that is stopping 4th year highschool students from moving up to college level, when they entered highschool under the 4 year highscool program of the 1982 Education Act. Did they not read our petition or do they lack the needed acumen to comprehend premises covered by common sense? The situation is more fraught because the DepEd Order was never published, thus it is an internal communication but is being implemented as a law to the entire nation. Tañada vs. Tuvera is conclusive. I am sorry for ranting like this, and I tried to contain myself since K-12's conception, birth and implementation, but now is the time for me to speak my thoughts once again as a human being with my universal right to speak my mind. How the Court could not see the urgency of the petitioners who unanimously sought for a TRO early last year makes them delusional unless they are trying to protect the Executive more than they should uphold the Constitution! I had so much regard for the Supreme Court until today! People Power will come your way. Worse, Duterte might just abolish and replace you under Martial Law. You better make your decision right.